Most of you are going to pay the same or probably more money to Jio compared to your current network provider. I explain you whole business Plan of Mukesh Ambani. Their tariff plans may look unbelievably awesome, but they will make more money by giving free voice calls than what the other companies make by charging you for it. In India, the monthly average revenue per user the current network providers get is around Rs 150 per month. That is the money they get on average from each user. If you spend over Rs 250 per month, you are considered a high value customer. It’s very simple just look at the Reliance JIO 4G traffic plans. If u spend more then 400rs/month on recharge & Data pack. Jio is best for them. 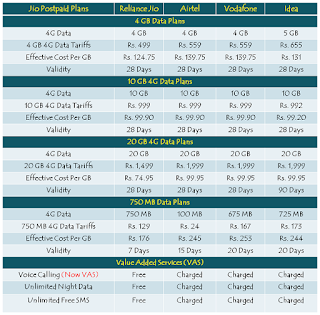 What about 50rs/GB or 25rs/GB Plan? Ans:- There is no such plan. Its Marketing gimmick. * So If u buy Higher pack u will get cheaper Data!! Is Jio provided Unlimited 4G Data in Night? 1. For Jio Night is short, only 3hr long. u can use unlimited data b/w 2am to 5am. 2. Its not clear unlimited Night 4G Data Applicable for all Apps or only Exclusive for Jio suite of apps. - Voice calls are truly free – you need not pay any charges for voice calls or the data used to make 4G voice calls. However, video calls will be charged. - “Unlimited Free Night Data” will be available between 2 a.m. and 5 a.m.
- Free Wi-Fi data will be available at Jio’s Wi-Fi hotspots only.All Jio services are free till December 31, 2016, including voice calls and 4G data usage. The plans above are applicable w.e.f. January 1, 2017. - Unutilized free benefits will be forfeited at the end of validity period and not be carried forward to the next billing cycle for postpaid customers. - Prepaid packs of Rs. 19, 129 and 299 cannot be availed as a first recharge. - Students will be provided 25% additional 4G Wi-Fi on providing valid identity card. - Prepaid tariffs are inclusive of all applicable taxes. - Applicable taxes will be extra for postpaid tariffs. 15% discount will be given to subscribers opting for e-bill and auto-debit option for their monthly bill payments. - These plans can only be availed by customers possessing a LTE compatible handset. If you check the table above, it is costing Rs. 499 for 4 GB of Jio’s 4G data. 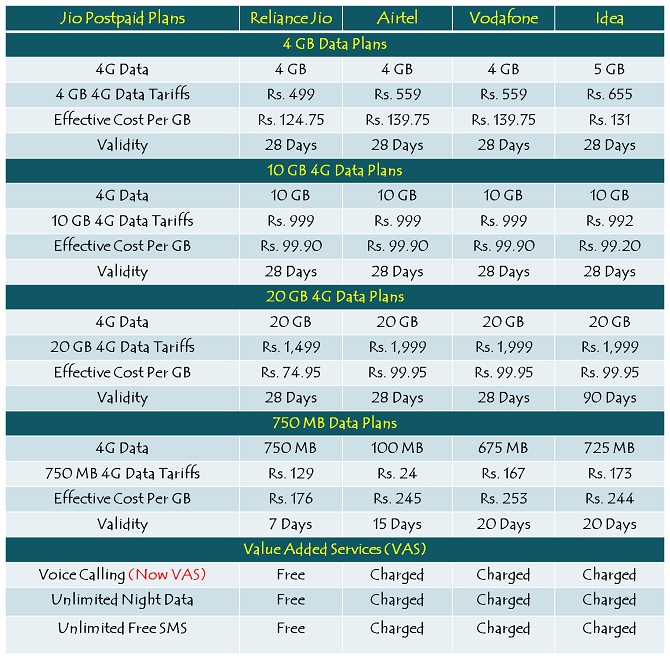 4 GB 4G data from Airtel and Vodafone costs Rs. 559, while 5 GB 4G data from Idea costs Rs. 655, which shows it is not amazingly cheap with Jio. It is just 5-10% cheaper with Jio as far as data charges are concerned. Moreover, when it comes to 10 GB data, there is no difference at all between what Jio will offer and what Airtel, Vodafone and Idea already have on table.